For most, the Tucson Festival of Books is an opportunity to rub elbows with some of the literary elite. Or at the very least, stare at them from afar working up the courage to have your tattered copy of a beloved novel signed. While we wait patiently for pages to be graced with an authors John Hancock, we rejoice in celebration of the art of literature and the written word with fellow bibliophiles. We stuff Bookmans’ totes with festival author novels and new non-fic finds. We emerge ourselves in panels and discussions on the writing process. But aside from all of that sweet bookish goodness is an array of community engagement and celebrations or art, science and learning. No TFOB event embodies this more than the Young Author Competition. 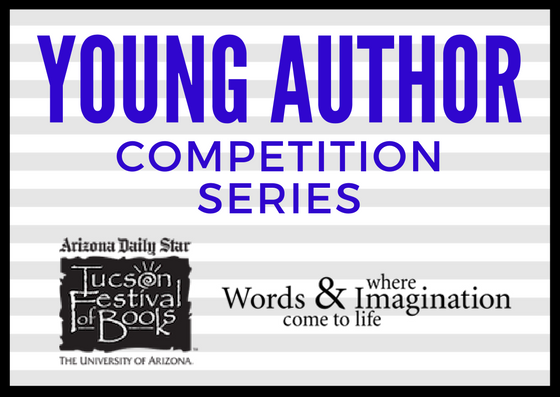 Sponsored by Altrusa International of Tucson in collaboration with Tucson Festival of Books, the Young Author Competition encourages young would be Pulitzer Prize winners to create. Whether it be through poetry, short story or essay, any child from pre-k to pre-college in invited to put pen to paper and try their hand at prose. Bookmans is once again involved in the Young Authors Competition and couldn’t be more thrilled to do so. In addition to offering prizes to winners in the form of some Bookmans gift certs we also invited a few to be featured here on Bookmans.com. Over the next few days we will be posting one entry each day leading up to Tucson Festival of Books. Please enjoy today’s feature The Bombings of Nagasaki by 5th grader Aurora Fontaine. “As I shot towards the floating graves, my bullets rained down with great fury. I watched the puny little black and white pigs run back and forth on the ship and loaded in the ammunition. I laughed to myself. They tried their best to shoot me out of the sky, but my B5N2 Bomber was much too fast for them. I searched for the blood-red button to release the torpedos, until I found it. I slammed the button down and opened the hatch. As the torpedo fell, I sped away. I wanted to be out of range of the explosion and the shrapnel. I glanced down through my window and saw it had landed in the ammunition compartment, just as I had hoped. I had just dropped the first torpedo exactly where I wanted it. Now I will be known as the hero of my country. The other pilots rocketed towards the enemy ships, and the first torpedo exploded, sending up a plume of smoke. With a satisfied smirk, I picked up the radio, and announced I had dropped the first torpedo destroying the enemy and their ammunition. Over the com my commanders said , “Now the Emperor will now your family’s name, Nagasaki Akio.” The other pilots were strafing the enemy base for two hours, and afterward they sped away with me hot on their tails. Suddenly I opened my eyes, and found myself staring at a wall. It took me a minute to realize where I was. I was on my sleeping mat in Nagasaki in 1945. I hastily put on my flight suit and headed outside all the while wondering if my memory dream was an omen of bad things to come? As I hopped into the cockpit of my plane, I did a quick sweep of things. Everything was in its right place. Not a cloud in the sky. The sea was sparkling. I breathed in the fresh air, and glanced at the picture of my wife, Mariko, which I always kept on my control panel so if in the event where I got shot down she would be the last face I see in this life. I knew my city would be standing, everlasting, and nothing could ruin my perfect morning. If you missed Part 1 or Part 2 we suggest reading the awesome stories these kids have written and stay tuned for the last part of our series during the Saturday of the festival.